Is it just me or has the past 2 weeks been wedding mania? I have seen at least 4 proposals and 6 weddings on Facebook! I often think about what I would want to do if I was planning a wedding. 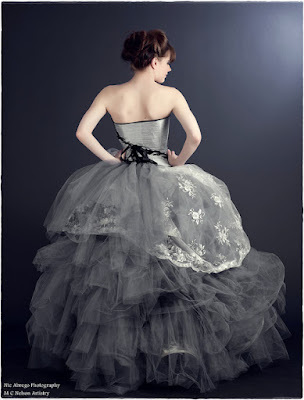 As I space out imagining an elaborate dark Victorian wedding, I run into KMK Designs on Etsy. The best part is that you don't need to to get married to buy one of these amazing dresses. These are really cool to look at as well - come and see. I'm starting to like mermaid dresses a lot. 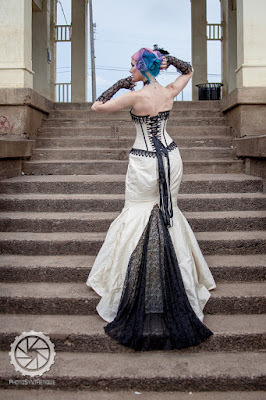 This gothic mermaid wedding dress is stunning. The intricate lace and ribbon work is impressive. If you're like me and enjoy bits of the traditional white color, but want more dark features on a wedding dress, this is a great option. A Tim Burton wedding would be a dream come true! Both of these Burton style wedding dresses are great options! Wouldn't it be great to feature all your favorite Tim Burton movies at your wedding? I would wear the black and white striped dress for other events as well. A steampunk wedding would be so fun to attend! 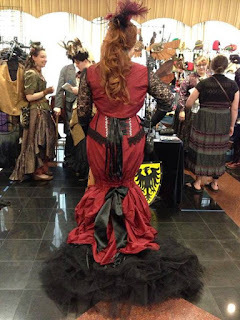 This steampunk wedding gown has really cool gothic features like the skull tree in the front. All the brown and green layers give this dress a lot of character. I wonder if you could integrate gears into it? 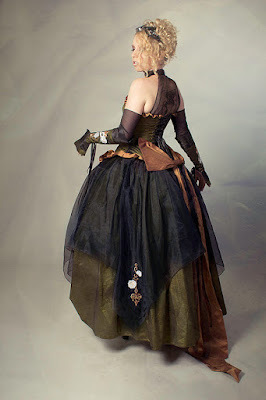 This masquerade steampunk gown looks like it came straight from a dark fairy tale. There are so many ways and places you could wear this dress. It also comes in more dreary colors like purple and black. I love the lace on the corset, it's gorgeous. Both of the pictures show different ways this dress could be worn. The red wedding dress looks like something a vampire would wear in the picture with the wolf. On the other hand, it also has steampunk features, especially when you add a feather fascinator. I can definitely see Snow White wearing this Edwardian wedding dress. It also comes in black, which is perfect for an evil queen. 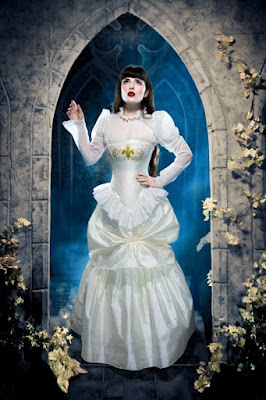 I like the fleur de lys on the front, but I would love to see the gothic cross featured on one of the dresses. This is like the darker version of the Cinderlla wedding dress. I prefer how it looks asymmetrical and hangs more to the right side. Aren't the rhinestones so elegant? It's perfect for a wedding! Does the top hat come with the dress? 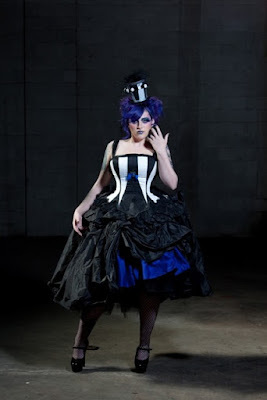 The Beetlejuice dress would be fun to wear to my next convention. 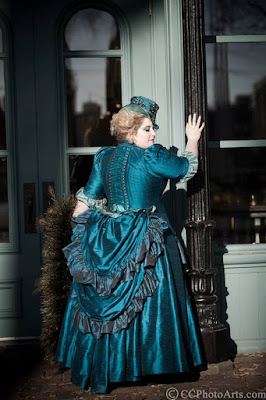 I wish I could tailor this myself, because I really do love the blue ruffle layers. 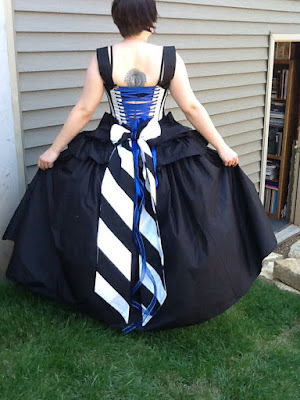 It oddly compliments the striped corset. My strange obsession with peacocks has attracted me to this stunning dress. The peacock wedding gown is a mix between Victorian steampunk and fantasy fashion! I love how it's laced on in the back. I think this is a really sassy and fun dress. 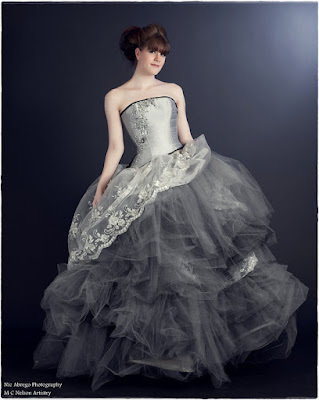 I find this romantic goth wedding dress to be perfect. It has very traditional features with an alternative twist. The black lace on the bottom is really gorgeous. What's better is that they have white lace and a black bodice as an option. I don't know if you have been struggling to find the perfect dress. At least KMK Designs on Etsy has all kinds of designs and colors to choose from. Not only that, but they can be used in other events aside from a wedding. Which one do you like the most? I definitely would pick this gothic mermaid wedding dress! Comment below!